Prophetic words from a great man, a great Pope who was lionized by the Jews in the waning days and years after World War II. Not until the calumny against him began in the early 1960’s did anyone regard him as anything less than a prophetic voice in the Church. I’m happy to have been a part of restoring the truth about Pope Pius in recent years. We look around us today, and often I hear people longing for the days of the 1930’s, 40’s, 50’s. It’s a romanticized period, a romanticism that made its way into my life in the eighth grade when the hit T.V. series “Happy Days” made its debut. It was an iconic time in American life. Jimmy Stewart and Donna Reed in Frank Capra’s “It’s a Wonderful Life”, Bing Crosby in “Going My Way” and “The Bells of St. Mary’s”. 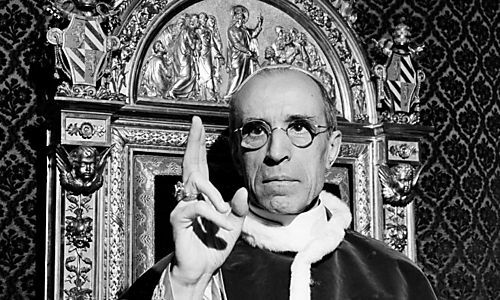 Rabbi Israel Zolli in 1945 converted to Catholicism with his wife, and in honor of all the Pope did for the Jews during the War took Pius XII’s name, Eugenio and had the Pope as his Godfather. Pius was pope during the most convulsive period in all of human history. Eighty percent of his priests, brothers and nuns in Eastern Europe perished at the hands of the Nazis, virtually all of whom were baptized Catholics and Protestants who turned their backs on their Christian faith and followed the bloodlust of one of humanity’s greatest tyrants. Some fourteen million people, including six million Jews perished in Hitler’s camps. Between 3.17% and 4% of the world’s population (62.5million-78.9 million humans) perished in that war. Pius saw the turn of Protestantism to the embrace of contraception in the 1930s, the rise of eugenics in the first four decades of the century, and the beginnings of Nazi atrocities developing first in the corrupted medical community. Pius eyed the thirty-plus states in America that had forcible sterilization laws on the books and was no doubt appalled by the U.S. Supreme Cout’s upholding of those laws in its 8-1 decision in Buck v. Bell. Margaret Sanger, a once devout daughter of the Church rivaled Pius for the hearts and minds of Catholic couples. Racism flourished in the Twentieth Century, and there were more man-made famines because of those intolerances than in any period before. Then came the perfection of annihilating humans by the millions with the atomic and hydrogen bombs. Happy days, they were not. Yet many long for those “simpler” times. In so doing, they overlook the challenges faced by Christians in those darkest hours of human existence. It has never been a good time to be a Christian. The Apostles, save John, all met a martyr’s death. The first few centuries saw Christians hunted down, fed to wild beasts in the Colliseum, doused in oil and used as torches. They met in catacombs, in the shadows. When I was confirmed, the Bishop tapped each person’s cheek as a symbolic reminder to be prepared to die for the faith. We’ve had twenty centuries of martyrs. We live today during the pendulum swing back toward eugenics, but we also live in great times as well. We no longer institutionalize the handicapped. They are integral parts of their families’ lives. We’ve developed miraculous therapies that teach them to speak, excel academically and vocationally. We now have sonogram technology that convinces 9/10 women contemplating abortion that there is a baby, marvelously fashioned, in her womb. We have cures for cancers, antibiotics, vaccines, abundant and inexpensive food. The list goes on and on. But we have our own challenges. We face a darkening world not unlike the darkness that enveloped Europe all those years ago. Like Einstein, we can no longer look to the newspapers or the universities for truth. Like Pius and the priests/religious/laity who heeded his call and paid with their lives, we are expected to stand and resist this evil, even at the cost of our own lives. Let’s take renewed strength and inspiration from Pius XII’s example and do the work we are called to do, both in the Church and in the Public Square, in order to prevent his dread prophecy from coming to fruition. Dr. Gerard Nadal is Science and Health Education Policy Advisor for the Bioethics Defense Fund. He holds a Bachelor of Arts degree in Psychology with a minor in Philosophy from Saint John's University, New York City. After his post-baccalaureate sciences at Columbia University, New York City, Dr. Nadal returned to Saint John's University where he received his Master of Science in Cellular and Molecular Biology, Master of Philosophy in Biology, and Ph.D. in Molecular Microbiology. Also a member of University Faculty For Life and the Catholic Writers Guild, Dr. Nadal is a columnist for Headline Bistro. Dr. Nadal also serves on several advisory boards, including the Coalition on Abortion/Breast Cancer, Good Counsel Homes, and the Children First Foundation. A Fourth Degree Knight of Columbus and unapologetic Roman Catholic loyal to the Magisterium, Dr. Nadal and his wife home school their three children. He blogs at Coming Home. Black History and Abortion: Genocide or Suicide?